All candidates participating in commencement exercises must wear approved traditional commencement attire. In addition to the cap and gown, candidates will be allowed to wear cords and/or sashes/stoles if such items have been previously approved by the Commencement Committee. Please refer to the guidelines below for seeking appropriate approval. Unauthorized ornamentation is prohibited. If any commencement official deems the attire to be inappropriate, the student will be asked to remove the unapproved item or the student may be denied participation in the commencement ceremony. Requests for special ornamentation should be forwarded to the Office of the Associate Vice Chancellor for Academic and Student Affairs at least 90 days prior to commencement in order to be placed on the agenda for consideration. The Commencement committee will only consider items that represent academic achievement from a nationally recognized academic honor society which requires a minimum scholastic rank equivalent to a 3.5 GPA for membership. National recognition may be in the form of membership in ACHS (Association of College Honor Societies) or via a demonstrated national governance structure including officers/board members elected by the membership and formal chartering of each campus chapter approved by official action of the governing body of the national organization. 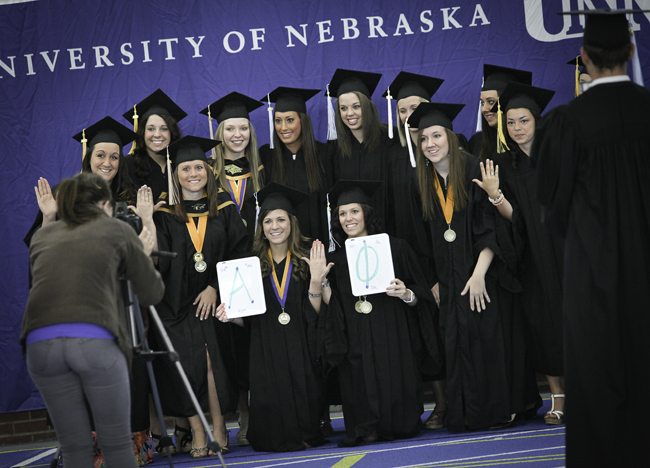 The only candidates that may wear a medallion are those graduating with university-wide Latin honors or the UNK Honors Program. The faculty/staff sponsor of the campus honor society should provide written request outlining how the chapter meets the required guidelines. The sponsor will be notified of the committee's decision by the Office of the Associate Vice Chancellor for Academic and Student Affairs following the meeting of the Commencement Committee.